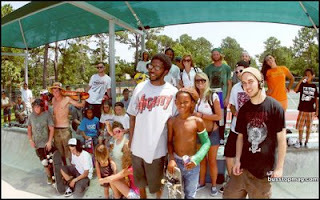 I would consider Go Skate Day in Jacksonville this year to be an overwhelming success. We started at Kona at midnight on Saturday night, and ended at Shantytown in Springfield on Sunday night, and every moment in between was worth remembering. On Sunday afternoon, we headed down to the Atlantic Beach park for the first leg of Bangers. (The park goes by many names, so I'll just stick with 'Atlantic Beach Park'.) As soon as I opened my car door, I was blasted by the hot Atlantic Beach air. I thought I was ready for it, but holy crap was it hot! 100 degrees outside. I guess I should have made note of the weather. The vibe here was the most mellow. People from around the area casually came in and out, I even saw a girl there just hanging out in a bikini. (Kind of made me feel awkward, they don't have those in Riverside.) The best trick contest went down over the door, which for obvious reasons didn't bring a ton of competitors, though the ones who did participate brought it in a big way. P-Nut even ollied the channel on his sword board. Holy crap. Not only that, but Darkness was there on a board that was at least 20 years old. I even saw that long board guy there! What is this guy's name? He ripped it up. Last time I saw him, it was when he was skating the miniramp at TSI. The ramp was barely wide enough for him to do an Axle Stall. Clyde was there to help Ryan King give out prizes, and when those were gone, we took our sunburnt selves to the next stop-Ed Austin park off Monument Road. Here are some photos from the event. Click the photo to go to the Flickr gallery, where you can see the full-sized images. This is the face you make when your skin is melting. 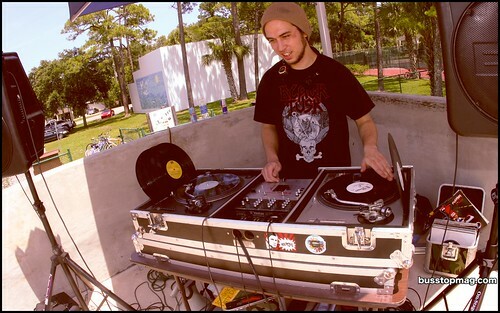 DJ Triclops, the Man behind Hip Hop Hell provided music for the event. I want a copy of that 'Jacksonville' Track. Mike 'Darkness' Barnes, Crailslide over the door. How he can skate on that board, I have no clue. Darkness was really feeling the 80s on Sunday. Joe M., too much sickness to capture in a photo. If you are smart, you move to the shade to announce a contest when the weather is over 100 degrees. Skating better than you, on a long board.